I noticed today that Norwich City’s head physio Neal Reynolds has left his post to join Arsenal as assistant to Gary Lewin. Well, we would have liked to have retained Huckerby’s services, but that didn’t happen either. Anyway, there’s just a couple more Silly Conclusions to come I reckon. Don’t want to bore you to tears. But, many thanks for all the comments on who you’ll be supporting for Euro 2008. It’s really interesting to see the freedom of choice we all have. There are many reasons for the country selected: some of you have chosen your Pro Evo (it’s a computer game) teams; some choices are based on a particular player; one is even considering going for the best looking team! Me? I haven’t quite decided yet. Maybe I’ll rope in a mate to help me choose - do this as a team. That’ll change the dynamic for The Silly Season 2008 Special, coming up in a week or so. You posed the best-looking question in your reply to my last comment... it's a tough one, I have to admit. With France, you've got Thierry. With Sweden, you've got Freddie (actually the only West Ham player with any hope of playing in the tournament) - so I should support him, right? Well he has a cracked rib, so he might not even play. I do have a bit of a thing for Nico Kranjcar... Apparently, too, West Ham fielded the most English players this season of any Premiership club. I'm pretty happy about that - and that's why I don't even have any player allegiances! Anyway, you really don't want to hear about my player favourites. In the end it's down to competition, because our season-ticket bunch are putting some bets down - only a £5 each, mind. We don't care that much. Have you decided who you'll support? At least your "defection" was an experiment, of sorts, and not just a job. The Silly Season: Hmm, I'm nearly there in the choosing front - just waiting for that moment of inspiration to hit me. Isn't it worse if I've just done it for an experiment instead of making a living? Surely you should pick one of the four favourites and start this experiment all over again? 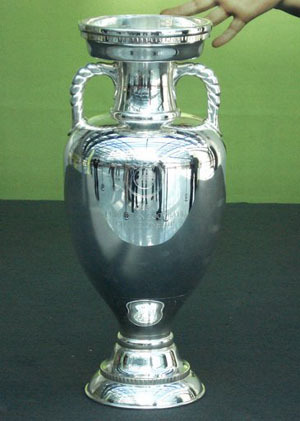 Lets face it, England have as much chance of winning anything than Norwhich have (if not less), so why not sell your national pride and see what it's like to really be proud of your (adopted) country for once and also not have to watch your (adopted) countries sunburned sweaty naked drunk ugly fellow fans riot if you lose in the quarter finals or however far we usually flop out of? The Silly Season: Well, I'm kind of sick of supporting a team that's supposed to win and doesn't after the Silly Season. At the moment I'm leaning towards supporting the underdog again (as I have all my life). As you say though, I'm just looking forward to supporting a country that have sunburned drunks.